Eggs, butter, sugar,flour, baking powder,cocoa and milk. I baked it at 180 degrees celcius for +- 30 minutes or until the cake is cooked. 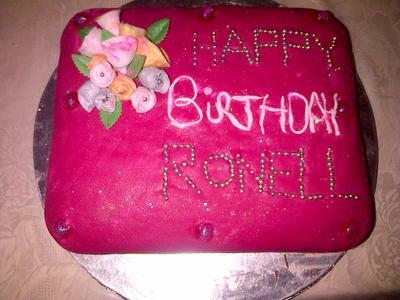 Thereafter cool the cake down and mix pink coloring into plastic icing or sugar paste icing (gum paste) and roll with icing sugar. Use icing sugar generously, the sugar paste must not stick to the baking board. Mix in a bowl some butter and icing sugar to form a butter cream icing and cover the chocolate cake using a spatula or knife. Thereafter cover the cake with the rolled sugar paste. Smooth any raw or broken edges with water. Make sugar paste roses by rolling out the sugar paste (gum paste). Use a tooth pick or floral wire and make a little bud. Cut out a small circle and cut the four corners half way into the circle. Poke the tooth pick or floral wire into the middle of the circle and wrap the sugar paste around the bud using a little water. Cut a bigger circle and follow same procedure.You can paint the roses any color using baking dust which you can buy from a baking supply store. Decorate with red cherries and little silver sweets. I must try this recipe, thumbs up girl!! Stunning cake...looks perfect for someone like me with a sweet tooth!